16 Day of Activism. Stop violence against women. 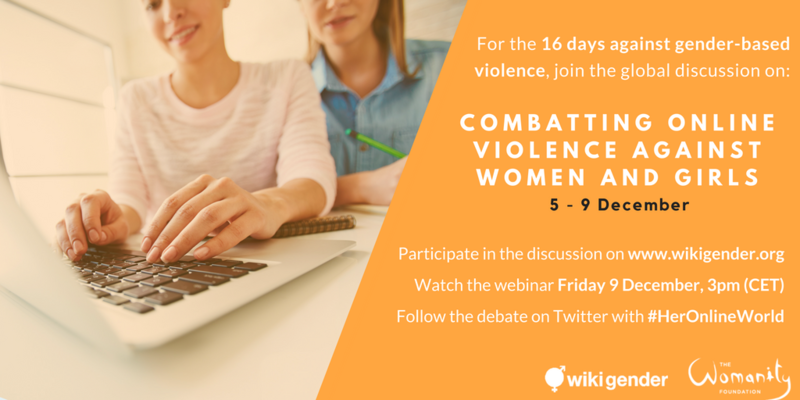 As part of a joint campaign with the Womanity foundation and Wikigender organised for the 16 Days of Activism against Gender-Based Violence, we invite you to participate into two new and vibrant online discussions and webinars. Wikigender and the Womanity Foundation are partnering to lead a 2 weeks campaign focused on the 16 Days of Activism against Gender-Based Violence (from November 25th to December 10th). The campaign will start on the 25th of November in honour of the International Day for the Elimination of Violence against Women, and will be divided into two main themes: engaging men and boys to end gender-based violence, and combatting online violence against women and girls. For each theme, an online discussion followed by a webinar will take place on the Wikigender platform. The discussions will provide a space for reflection, debate and learning for diverse online audiences. 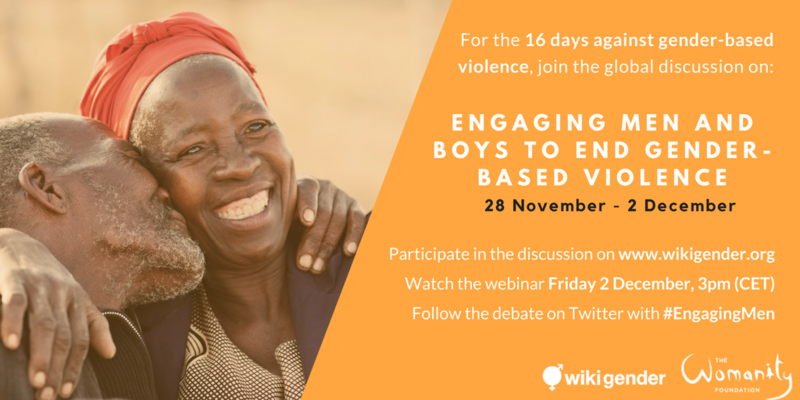 The first online discussion will start on 28th November and will focus on Engaging men and boys to end gender-based violence. The discussion will take place from Monday 28 November to Friday 2 December 2016, and will conclude with a webinar on Friday 2 December at 3pm (CET). Find out more about the discussion, the key questions and partners by visiting the Wikigender page and register for the webinar here. You can contribute to the discussion beginning 9:00am on the 28 November. In recent years, the need to ensure women’s and girls’ safety online has gained international attention. This has been spurred by increased media attention spotlighting the devastating psychological impact cyber bullying can have on victims as well as research revealing the pervasiveness of the problem. However lack of comprehensive legislation in this area leaves internet users, and in particular women and girls who are more likely to be targeted, without legal protection or recourse to justice and psychosocial support (United Nations 2015). In the absence of legal reform, many organisations have already started to take action to protect women and girls online through innovative tools. Organisations such as Luchadoras, Take Back The Tech!, Digital Rights Foundation, Tactical Tech, Internews, and Chayn, among others, are working with women to reclaim online spaces. Through digital tools, security training, and advocacy campaigns, these organisations are leading the fight against many forms of gender-based violence using Information and Communication Technologies (ICTs). Other approaches have included pushing for challenging social norms that underpin online harassment and bullying in order to guarantee women’s and girls’ online safety. Within the framework of the 16 Days of Activism against Gender-Based Violence Campaign, Wikigender and Womanity are organising an online discussion on the theme “Combatting online violence against women and girls”. The objective of the discussion is to facilitate a global dialogue on gender-based violence online, including on prevention and coping mechanisms: questions will aim to collect best practices and lessons learned while identifying entry points for change. The joint efforts of Wikigender and Womanity will bring together diverse networks of researchers, civil society, students and NGOs with unique perspectives and great potential for knowledge-sharing. The discussion is open to the public and participants are invited to contribute from Monday 5 to Friday 9 December on the Wikigender platform. In order to nurture an inclusive conversation, the discussion will take place in both English and French and will engage with online communities through Twitter and Facebook with the hashtag #HerOnlineSpace. The concluding webinar, on Friday 9th December at 3pm (CET), will be an opportunity to hear directly from the experts, who will be available to answer any questions and to debate in real time. Find out more about the discussion, the key questions and partners by visiting the Wikigender page and register for the webinar here. You can contribute to the discussion beginning 9:00am on the 5th December.